Hey everyone,following a motion passed in Guild Council last academic year there are now (among other changes) 5 reserved places in Council for BME (Black & Minority Ethnic) students to represent BME students. 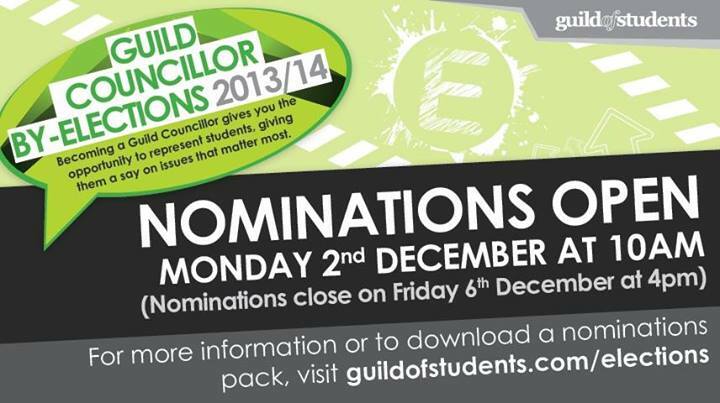 Nomination packs and further details for these positions can be found on the Guild website here (there are also a number of school/departmental Councillor positions to run for too; check out the link) nominations for these positions close this Friday 6th December at 4pm. BEMA strongly encourage BME students to apply and run for these positions, so as to get more plurality and more diverse representation of BME perspectives and interests in Council. Guild Council is the highest student-run democratic body in the Guild and decides upon the direction, campaigns and action the Guild takes on behalf of its student membership. Whilst having a lesser say than Guild management and its Trustee board, a number of positive outcomes have been won for BEMA students in Council over the years, including securing annual funding for Black History Month, giving Liberation associations more autonomy over their affairs and respective officers, and getting the Guild to oppose the Islamophobic ‘Prevent’ counter-terrorism initiative which encourages spying on Muslim students.The voting records thus far of the BEMA Guild Councillor can be found here. While BEMA cannot support any individual’s candidacy (and while BME Open Place positions won’t be accountable to BEMA per se, but still representing BME students) we’d be happy to help out any brothers and sisters through the application process, and look forward to seeing them in Council come January. P.S. Also don’t forget – BEMA reps applications are open until Sunday night also.